Krafting Kreations: Birthday Presents Anyone? Are you in need of some birthday presents? How about the ones on this card? Another sketch challenge! 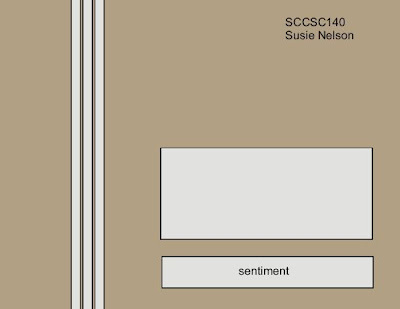 This one is for SCCSC140. This will make a fabulous guy’s birthday card I think. Take a look! I started off this card by cutting a piece of Basic Gray card stock 4-1/4” x 11” and scored it at 5-1/2”. 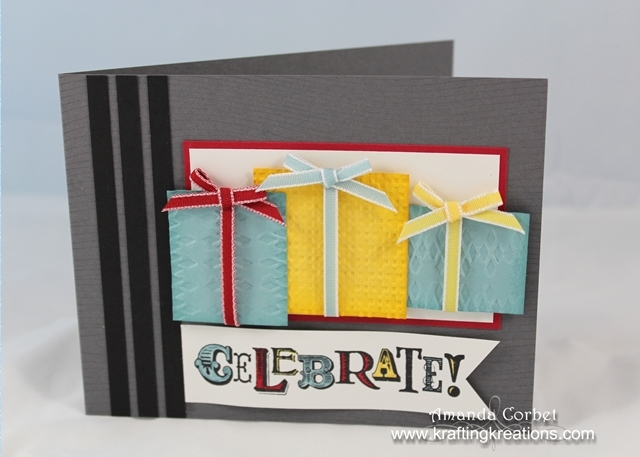 I stamped the card front with the Woodgrain background stamp in Basic Gray ink. Next I cut three strips of Basic Black card stock 1/4” x 4-1/4” and adhered them onto the left side of the card front. Then I cut a piece of Whisper White card stock 2” x 3-1/2” and adhered it onto a 3-5/8” x 2-1/8” piece of Real Red card stock before adhering it onto the card front. I cut a piece of Whisper White card stock 1” x 3-3/4” and stamped the greeting from Seasonal Sayings onto the card stock in Black Stazon ink. I colored in the letters of the greeting with Baja Breeze, Real Red, and Daffodil Delight markers then used Paper Snips to cut the right edge into a dove-tail shape. 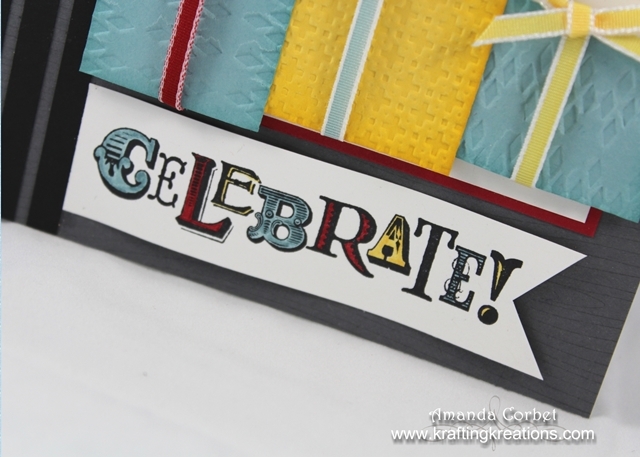 I curled the strip over my finger to give it some shape and adhered it onto the card front with a couple Stampin’ Dimensionals. Present time! Who doesn’t love presents? Well here is how you make these. Cut one piece of Baja Breeze card stock 1-1/4” x 1-3/8”, another piece of Baja Breeze 1-3/8” x 1-5/8”, and one piece of Daffodil Delight 1-3/4” x 1-3/4”. 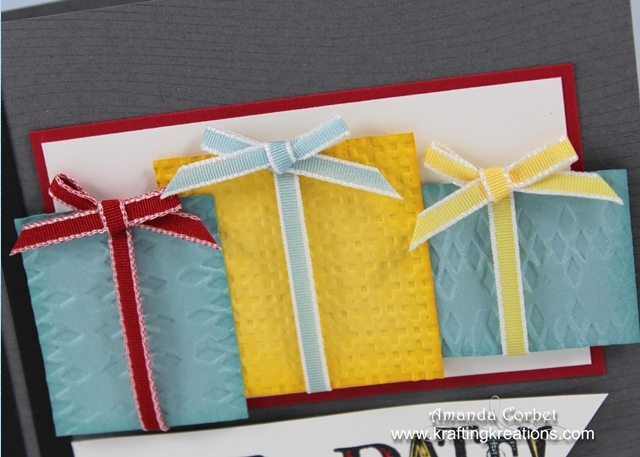 I ran the Baja Breeze pieces through the Big Shot in the Argyle embossing folder and sponged the edges with Baja Breeze ink. I ran the Daffodil Delight piece through the Big Shot in the Square Lattice embossing folder and sponged the edges with Daffodil Delight ink. I cut a piece of ribbon just long enough to go around each present and adhered the ends onto the back of the card stock with a little bit of SNAIL Adhesive. Then I adhered the presents on top of one another. I tied a small bow in each of the ribbon colors and adhered each bow on top of the coordinating present with a Glue Dot. The line of presents was adhered onto the card front with a few Stampin’ Dimensionals. Cute huh? I am totally pleased with myself on this one!